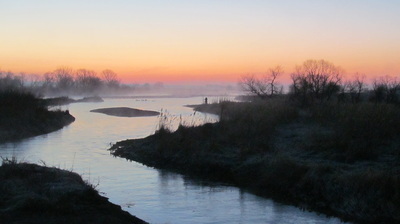 According to Dr. Paul Johnsgard, Garden County and Lake McConaughy make up the third best birding area in the United States with widely diverse eco-regions including the sandhills with many lakes, the North Platte River valley, wetlands at the head of Lake McConaughy and the lake itself. 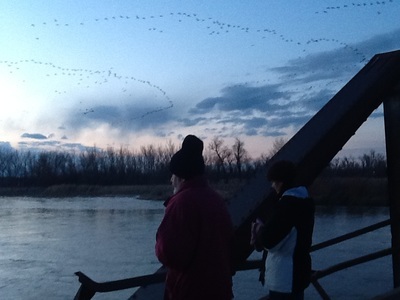 Each March and early April, 20,000 or more greater sandhill cranes gather to rest and refuel along a 15-mile stretch of the North Platte River between Oshkosh and Lake McConaughy before continuing north to nest. 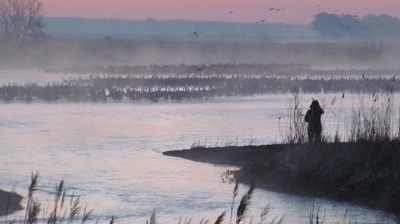 While not quite on the scale of the aggregation of half-million lesser sandhill cranes along the Platte in central Nebraska (touted by Roger Tory Peterson is one of the "ten most spectacular wildlife events in North America"), the gathering of cranes near Lewellen is awe-inspiring and not to be missed. Visitors are moved to tears by the sight and sound of thousands of trumpeting cranes descending to their island roosts at dusk and blackening the horizon at fiery dawn. While watching the cranes, you're likely to see mink or river otters frolicking in the river, white-tailed deer bounding through lush meadows, or wild turkeys skulking through streamside thickets. Clear Creek State Wildlife Area, just a couple of miles downstream from Lewellen, supports tens of thousands of migrating snow geese in early spring and at least 80 species of nesting birds in late spring and summer. 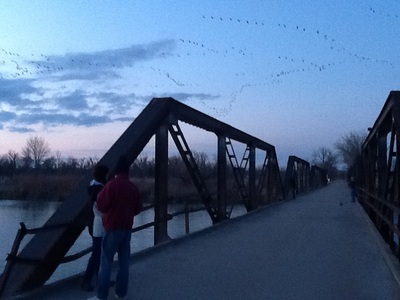 Our favorite place to observe the evening fly-in of the cranes is the old Lewellen bridge, located just a half mile south of town. You can stand on the abutments of the historic bridge and watch the cranes glide by. We often see river otters or mink near the north abutment. At dawn, you can see 5000 or more cranes lift off from their roosts just a few hundred yards east of the main highway bridge. During the day, the cranes gather in corn fields and meadows north of the river. Drive the county roads north of the main highway linking Lewellen to Lemoyne. By the second week in April, most of the cranes will have flown off toward nesting areas in the northern Rockies, Canada, and Alaska. But the memory of their haunting, 65-million-year-old voices remains in our hearts and keeps us coming back to Lewellen spring after spring. Sandhill Cranes have been flying over Nebraska on their annual jaunt from Texas breeding grounds to Northern states and Canada for forty thousand years. * Their haunting trill pierces the air in February as they start to arrive, soaring thousands of feet up. You might find it hard to spot them at first but catch the sun shining on their wings as they turn and sway. As the flocks arrive in force they make daily trips from the river out to cornfields and other feeding grounds, providing great viewing morning and evening. Sandhill Cranes fly over in October on their way to Texas, but viewing is spectacular in March as they feed and build up their bodies for their long migration north. The Lewellen area has been blessed with a few Whooping Cranes on occasion, but guests are more likely to see a white crane the same size as the Sandhills. This Leucistic Crane is not a true albino, sporting the same red mark on his head as the regular Sandhill Crane. A Common Crane (or Eurasian Crane and rarely seen in the US) has also been spotted east of Lewellen for several years. Greater Sandhill Cranes compose about 75,000 of the total 500,000 Sandhill Cranes found in the United States. The male averages 11 pounds, 47 inches in length and has a wing span of 7 foot. *Fossil records of cranes date back 9 million years. The oldest unequivocal Sandhill Crane fossil is "just" 2.5 million years old. Trumpeter Swans are on the rise in Garden County. Up to nineteen are regularly seen just west of Lewellen along the county roads and flying to the river each day. Be sure and check out the Crescent Lake Wildlife Refuge to book a blind in April to see dancing Grouse.